It's The Hubble Space Telescope's Birthday. Enjoy Amazing Images Of The Lagoon Nebula : The Two-Way This month marks the Hubble Space Telescope's 28 years in space, and as a gift to us earthlings, NASA and the European Space Agency issued photos of colorful, explosive beauty. 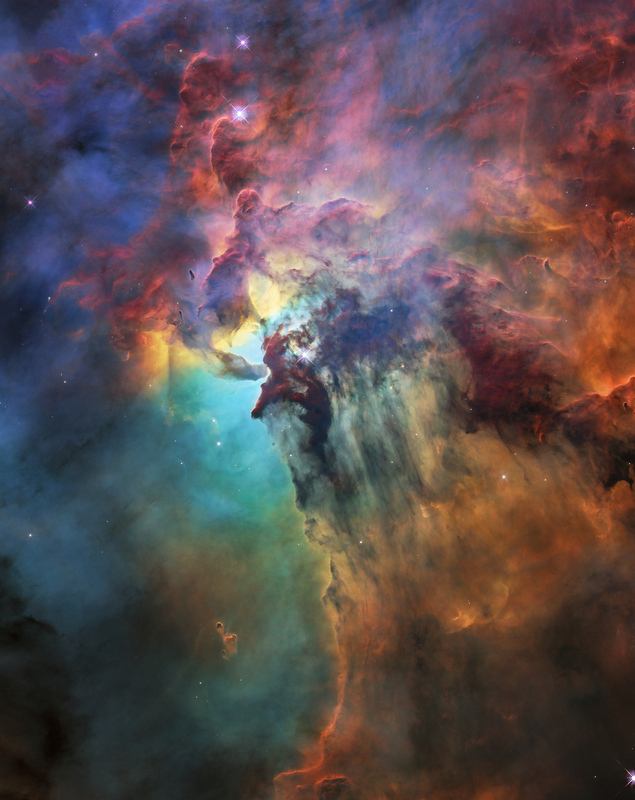 This month marks the Hubble Space Telescope's 28th anniversary, and as a gift to us earthlings, NASA and the European Space Agency are celebrating with a batch of stunning photos of the Lagoon Nebula, in all of its swirling, explosive beauty. A NASA/ESA Hubble Space Telescope image of the Lagoon Nebula, which is about 4,000 light-years away. It was taken by Hubble's Wide Field Camera 3 in February. The image was released to celebrate the 28th anniversary of Hubble. The Hubble "has offered a new view of the universe and has reached and surpassed all expectations for a remarkable 28 years," the agencies said in a statement, adding that the telescope has "revolutionized almost every area of observational astronomy." This year's featured image, the Lagoon Nebula, is a colossal stellar nursery, 55 light-years wide and 20 light-years tall, that is about 4,000 light-years away from Earth. This video zooms into the core of a rich star-birth region called the Lagoon Nebula, located in the constellation Sagittarius in the direction of our Milky Way galaxy's central bulge. In addition to the image in visible light (shown above), Hubble also grabbed an infrared view that cuts through the dust and offers a glimpse of the brilliant stars forming inside the stellar cloud. While the observations in visible light allow astronomers to study the gas in full detail, the infrared light cuts through the obscuring patches of dust and gas, revealing the more intricate structures underneath and the young stars hiding within it. Only by combining optical and infrared data can astronomers paint a complete picture of the ongoing processes in the nebula. This short video clip shows the Lagoon Nebula, which was observed to celebrate Hubble's 28th anniversary in space, first in the visible light and later on in the infrared. NPR's Skunk Bear marked Hubble's 25th birthday, with the gift of song. It's a delightful tune — a parody of Iggy Azalea's "Trouble" — recounting the tale of the telescope's history. The Hubble Space Telescope has been staring out into deep space since 1990. In celebration of its 25th Anniversary, I wrote a parody of Iggy Azalea's song "Trouble. The Hubble website also released a bit of trivia to mark the anniversary: Since its launch, the space telescope has made more than 1.5 million observations of more than 43,500 celestial objects. It has made more than 163,500 trips around Earth. And astronomers using Hubble data have published more than 15,500 scientific papers.